I have a 98 Ranger 2.5, 5 speed, 2wd, single cab. The front bumper is tweaked and the lower valence was messed up too. I tore the valence off in hopes of making it look better, but it just looks much worse. I walked around the local yard this morning and could only find a couple clean older Explorer bumpers, like this one. It was either a 95 or 96 model. This yard is dirt cheap and I can get the bumper for 35 bucks. I did find a newer Explorer bumper, but it was pretty rough and a new skin is 100 bucks. Has anybody ever put one of these on a 98+ Ranger? I assume the bolts won't line up, but I can make brackets if I have to. The bolts will line up, but the body lines won't. I tried this before, and ultimately it's a waste of time and money. Even if you manage to get the bumper high enough, the grille and headlights won't line up. 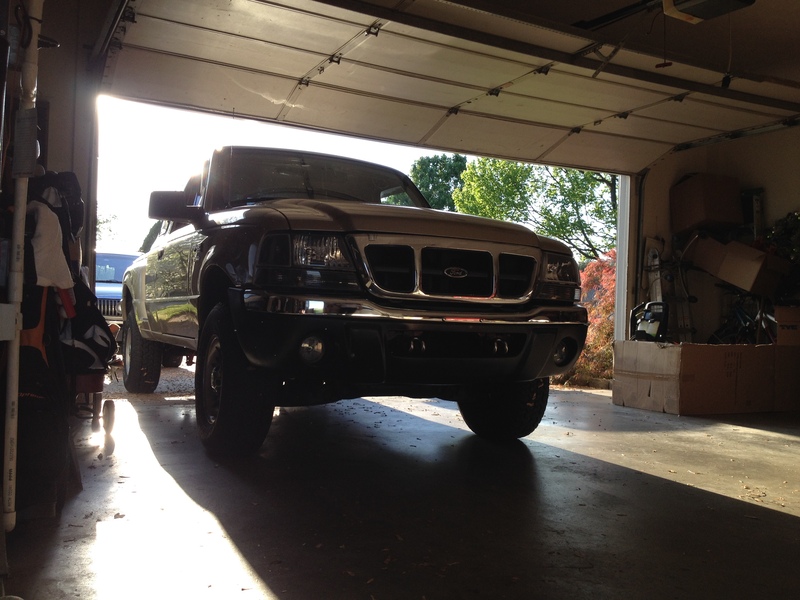 Go with either a factory bumper, or shoot for the 01-03 edge / xlt bumper like I have. Nice upgrade over stock. Gonna hit up a bigger yard tomorrow and see what I can find. Dug up this photo from my failed attempt. This bumper is at the top of it's travel, btw. Still have the bumper, too. I'll second that! Expo bumpers seem to be a no-go no matter the year. My truck has an '02 Expo bumper with those very same issues. 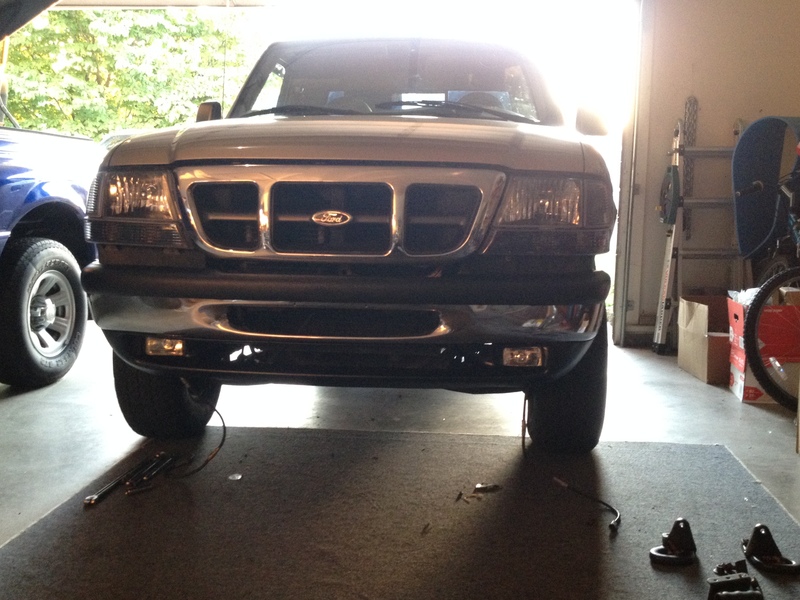 My mounts are slotted and the bumper is forced up into the grill but leaves a huge gap under the lights. Do what theArcticWolf says, I have almost $100 in a bumper that disappoints me. The main problem with this bumper swap in general, is the expo and ranger front clips are designed completely different. The relief angles are so wildly different, for one thing. The expo's underheadlight and grill line is mostly flat, where as ours dips down into the bumper more. Not a significant amount, but enough to make a big difference. Honestly, I feel the only place an expo bumper has on a Ranger is when someone does an expo front end swap. Snagged one of these off an 01 or 02 Ranger. The question is, will this go with the factory 98 grille and headlights? 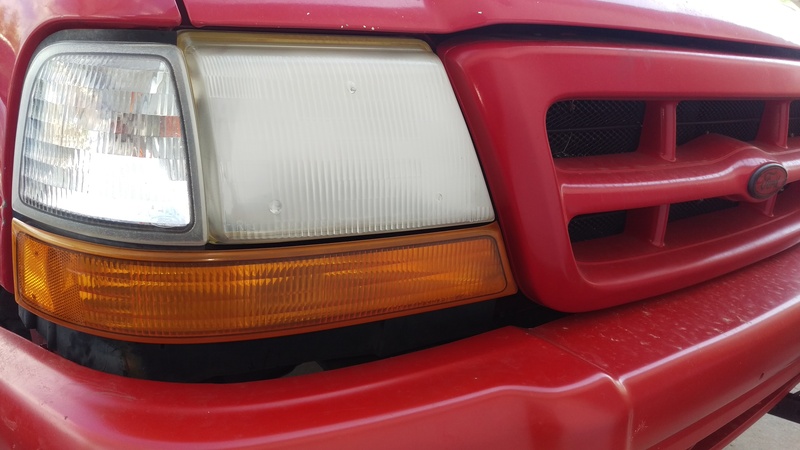 The truck I got the bumper from still has the grille and headlights, so I can get them if necessary. Probably will end up doing it anyway, the pieces on my truck are loose and poorly fitted anyway. You'll end up with exactly the same look I have. The Ranger from 98-00 are indistinguishable from each other, looking from the front. It'll bolt up and look just fine. You can swap front ends if you like, but ultimately it's unnecessary. Great. I was worried that there would be a gap or something under the headlights. But I see that the 98 uses a smaller headlight and turn signal underneath, while the 01 has a larger headlight with a small filler panel underneath. There will be a small gap between the headlight and top of the bumper, as you can see. However the gap is not a huge one, it's about the same as what it would be if you had the 01-03 header panel with accessories. However, considering that to change bulbs in the turn signal housing you need to remove two bolts within said gap, it's a non issue. I have seen people completely eliminate this gap, however. Thankfully, the 'bumper line' on the 98-00 rangers are very similar to the 01-03, which makes this possible. Very popular swap, too. Installing one of these bumpers is as easy as removing the old one and popping the new bumper in it's place. No mods to the truck itself are required. Have a buddy to help you; these bumpers are awkward to work with. The nut size should be 19mm or 3/4. Penetrating oil and a breaker bar are your friends. Maybe an extension. If you've got an impact, use it. The bolts may be rusty, depending where you live and all. Btw, it's worth snagging the powerdome hood (if it has one) assuming it's in good shape. Another bolt on swap that looks awesome, which is also popular. The truck on the right doesn't have a powerdome hood, the one on the left does. And yeah I know, I'm whoring my pics here, lol. If nothing else, it'll give you an idea of what you can expect from swapping out those parts. You've been a great help, thanks. The hood is there and in good shape. It's white though, my truck is maroon. Will throw it on tonight and see how it looks. You're welcome. Getting it repainted shouldn't be too awful expensive. I was able to get mine repainted for 200 bucks plus tax, plus the 135 for the hood. can anyone tell me, what am i missing here?